Fall might be just around the corner, but looking at the weather forecast around here, you wouldn't know it. Far from giving up without a fight, summer is hanging on like a bulldog with a juicy bone in what I can only hope is the last heat wave of the summer. Like many of you, I'm sure, I'm ready to trade in breezy skirts for wool trousers, and sleeveless tops for snug overcoats; but Mother Nature has other plans. While there's not much we can do about those plans, we can at least make ourselves more comfortable until the winds change. Watermelon has a well deserved place in the pantheon of classic hot weather refreshments: cool, crisp, and juicy, it shines without any interference whatsoever. 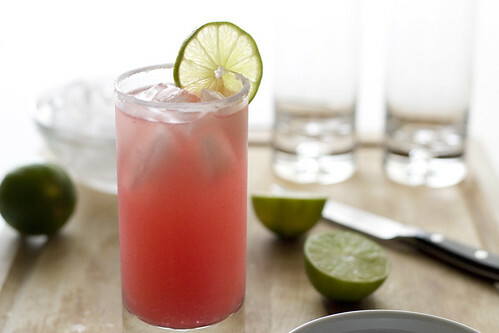 But if we're in the mood to take a good thing and make it even better--and let's face it, when it's nearing 100F outside I'll take all the "better" I can get--we can add some lime. 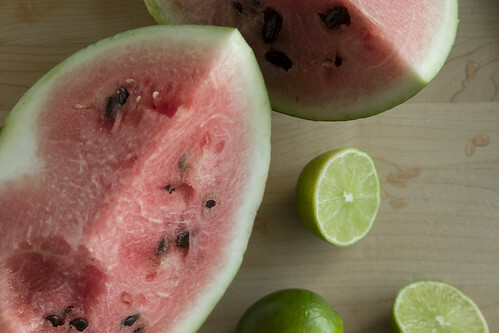 You can squeeze a lime over slice of watermelon, of course, and for quick-and-easy, that's the way to go. (Plus, who doesn't love biting into a big piece of watermelon and feeling the juice dribbling down your chin?) But if you're looking for slightly more dignified, a tidier option (at least after the prep is done) is to take the watermelon, the lime, and anything else you want to include, and turn it all into something you sip. The Mexicans figured this out ages ago: they made aguas frescas, or "fresh waters," out of all manner of fruits and other foodstuffs. 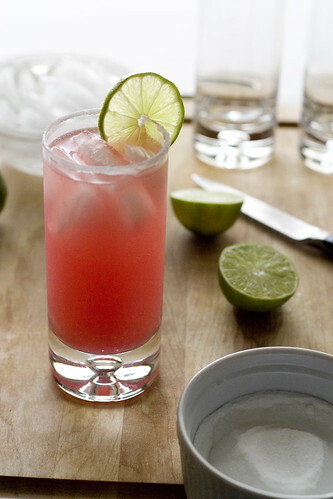 In the end, that's all this is: watermelon agua fresca, laced with lime and a hint of sugar. I'm not going to write up a proper recipe this time, because the proportions are simply what you want them to be. 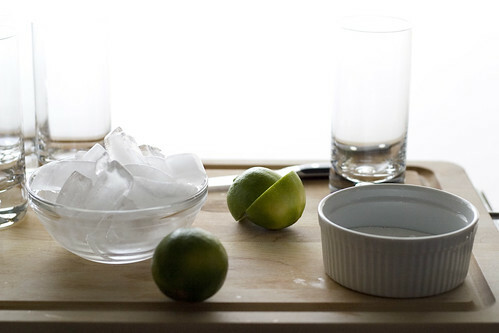 You might like a lot of lime, or not much at all; plenty of sweetness, or perhaps a dash of salt. It's easy to adjust the flavors, so taste early and often. 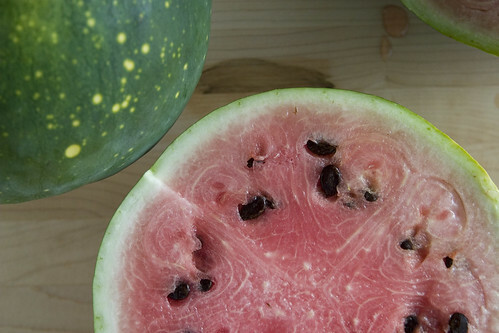 Unless you have a very small watermelon, you will probably have to do things in batches, which makes it easy to test out lime and sugar levels on a small scale before fully committing. For the first step, you'll likely want some sort of electric blender or food processor. Alternatively, you could do it by hand by pressing the watermelon chunks through a sieve, or perhaps gathering them up in a large piece of cheesecloth and squeezing until you've extracted all the liquid. (Now that I think about it, that method actually sounds like a lot of fun, if very messy indeed.) To keep things easy, though, I recommend a blender. Toss a bunch of watermelon chunks and their accumulated juices into the blender--maybe with a bit of water to get things moving--and blend until smooth. Next up is the (slightly) tedious part: passing the watermelon liquid through a sieve to get rid of the tiny solid bits. It's a pain, but it makes for a cleaner final product--and if you're looking for a bright side, it's not as bad as passing pureed raspberries through a sieve. My watermelon, about 10-12 inches in diameter, yielded about four cups of juice. Your mileage may vary. With juice in hand, the only thing left is to play with the flavors. You can use granulated sugar to sweeten your agua fresca, but I prefer to use simple syrup. Otherwise, you might have a hard time getting the sugar to dissolve in the cool liquid. To make simple syrup, place two parts sugar and one part water (by volume) in a sauce pan and bring to a boil, stirring often. Stir until the sugar has completely dissolved, then let cool. You can store any unused syrup in a jar or bottle in the fridge; it keeps for quite a while. 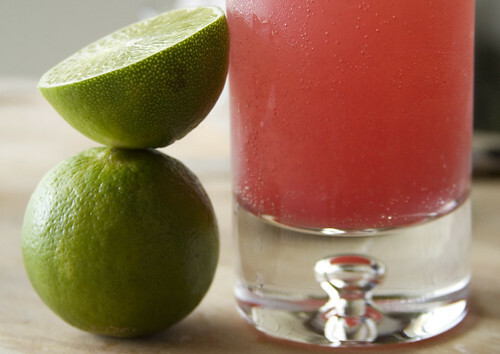 Typically the fruit juice for agua fresca is cut with water, so that it's more of a flavored water than a juice. Plain water does the job just fine, but I find that sparkling water (such as club soda or, if you prefer, mineral water) takes the "refreshing" factor and kicks it up a level or two. Either way, whether you use sparkling or still water, you'll have a drink that's brilliant for beating the heat--and giving summer a sweet sendoff. Lovely photos! You have a great blog. My older Texas relatives used to salt their watermelon, but they lived in the state before air conditioning! I don't think any of us ever get that dehydrated (but it does sound better than gatorade). I'm wearing a fleece, and the sky is gray, but your words are so vivid and transporting that I can almost imagine the heat and the watermelon/lime refreshing deliciousness. Such beautiful writing and pictures; really, you should become a full-time food writer. We don't get watermelon in England. That is just sad. This sounds fantastic... I'd probably add a lot of lime too. And as soon as you said sparkling water, I started craving this drink! I, too, wish this warm weather would hit the road. I have sweaters that need wearing! Cheers, Ms. Big Sur and Chilli! Bee, salted watermelon really does sound better than Gatorade! It is such a shame that you don't get watermelon in England. I suppose it doesn't get hot enough for watermelon to thrive. Do you get other types of melon, or no melon at all? I long for grey, threatening-rain skies and fleece-friendly weather, but I think we still have a while to wait. Megan, I love the way you put it: I have sweaters--and hats, and scarves--that need wearing! mmm. 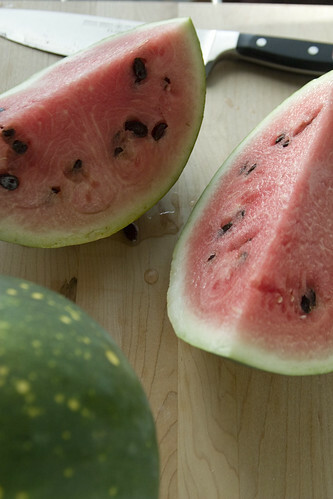 watermelon and lime. but i fear i wouldn't be able to resist adding a bit of tequila.